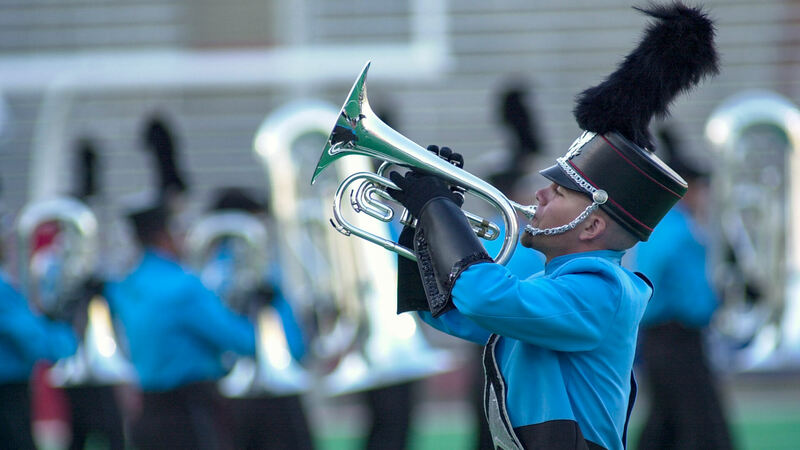 The 2002 Drum Corps International World Championships marked DCI’s 30th anniversary. Held at Camp Randall Stadium in Madison, Wisconsin, The Cavaliers capped off an undefeated season with a then-record high. Only 1.95 points separated the 10th and 15th place corps in the Thursday Quarterfinals event. 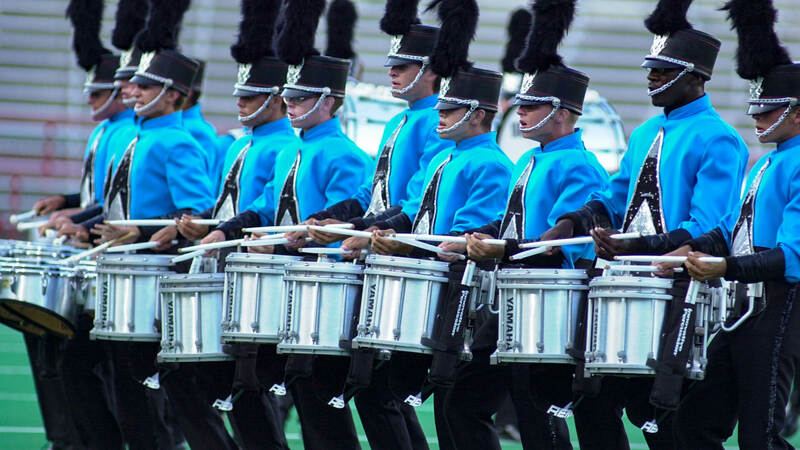 Magic of Orlando advanced into the Finals competition as a Division II corps after being inactive in 2001, and Seattle Cascades earned a spot as a top-12 finalist after being a Division III corps just two years prior. One other corps made Finals that wasn’t in the big show in 2001; Spirit from Jacksonville State University. In fact, the 10th-place corps hadn’t been in Finals since 1990, and in 1996 had placed as low as 23rd. Watch Spirit's "Darkness Into Light" on DVD. Spirit took the field with its new moniker adopted just the year before, when it crossed the state line between Georgia and Alabama and started a seven-year sponsorship by one of Alabama’s higher education institutions. Jacksonville State University had a long association with the corps, supplying several dozen performers to its ranks and co-hosting DCI Tour events. This sponsorship helped infuse the corps with a stronger competitive viability and assured its survival for many years. 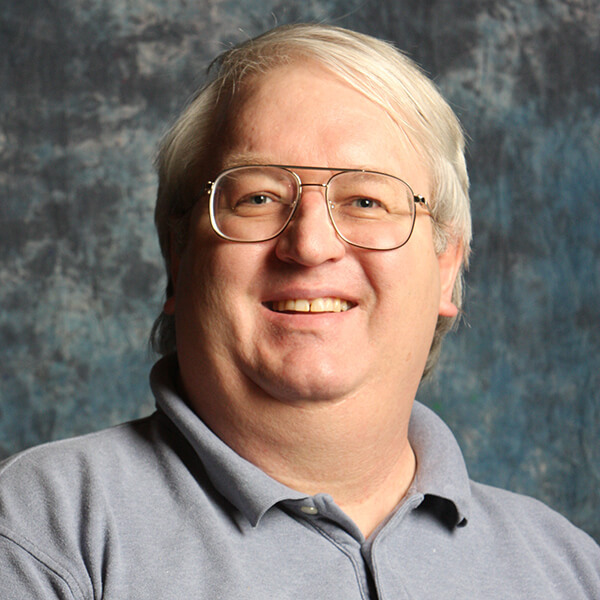 Holsinger composed the movement in 1995, seven years after he wrote the symphony’s first movement, “The Death Tree.” Until being commissioned to write the final segment, the composer had believed the symphony would never be completed, as he thought the existing material stood on its own. Corps arrangers Mark Fifer and Clint Gillespie wrote additional original material for the show that served primarily as connective tissue between Holsinger’s segments. According to the composer, the arc of the story line traveled from the violence of the darkest depths of despair to the tranquility of the glorious gates of heaven, in a sense reflecting the corps’ own resurgence, and, as some might say, its competitive reincarnation. Along the way, a sinister pulse suggested that the trials and tribulations of existence were never far away, and although the music ultimately headed toward the final climax celebrating the victory of life over death, the prospect of continual despair never seemed outside the realm of possibility. A poignant moment caught on camera was a close-up of a front ensemble member, tears running down her cheek as she listened to the corps being announced by DCI Hall of Fame public address announcer Brandt Crocker, absorbing the magnitude of the audience welcoming Spirit back to the Finals for the first time in a dozen years. The opening moments of the show were violent and angry. Deafening staccato brass chords were accented by jarring percussion such as a quite dominant anvil. 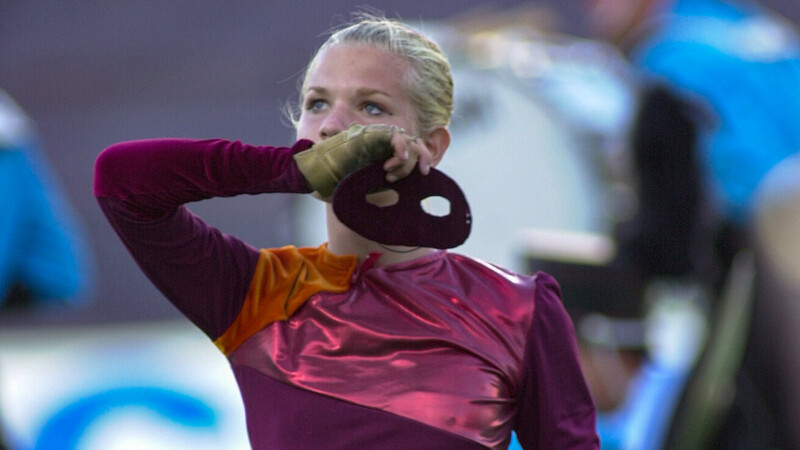 A sinister metallic pulse continued under the angular melody, with the menacing nature reflected by the black eye masks worn by the color guard members. The music was much more drama than actual melody, said by staff members to represent the lowest points in one’s life. Visually, out of the torment appeared a diagonal block cross, providing a glimpse at salvation. However, it was rapidly wiped off the field as fear and trepidation were not yet ready to give up. Toward the end of the movement, the brass players were gathered in a block triangle and alternatingly pivoted in opposite directions while repeatedly playing a dissonant chord, visually emphasizing the Doppler effect amongst the horns. The entire opener was relentless in its sheer violence, ominous and foreboding and taking no prisoners. The intensity of the opener made the melancholy tranquility of the second segment of the show all the more contrasting in comparison, a lovely trumpet solo accenting the change of demeanor seeming to shine sunlight on the prior darkness. It was music of salvation and forgiveness, and it was gripping in the sincere pleading of its simplicity, offering a way out of the tumultuous darkness. The dark masks came off the color guard performers as hope began to take hold of the proceedings, with bright red and orange overlays replacing the more solemn burgundy costumes of the opener, echoed in flags of the same colors. This closing movement was one of sheer exuberance and happiness that was almost giddy in its anticipation of what was to come. This was the segment Holsinger wrote to represent personal salvation, a time during which one’s troubles would be nothing but distant memories. Poking through the music was the sound of chimes that could be imagined as representing the peal of church bells. At the end, a series of final marching drill evolutions led the performers into the form of the corps’ delta insignia, signaling that Spirit had fought through its own despair of darkness and was back where the corps belonged.